Onshore flow brought moderate falls to the east coast between central Queensland and northeastern New South Wales at the start of the week, while a low and a cold front produced moderate falls over southeastern Australia mid-week. Past seven days: At the start of the week, a surface trough and weak low pressure system extended through eastern Queensland to northern New South Wales, and combined with an onshore flow to produce showers and moderate falls on Queensland’s central coast and in southeastern Queensland and northeastern New South Wales. In the west, a cold front tracked across southwest Western Australia, with widespread light falls reported in the South West Land Division; higher totals were recorded in a small area of the southwest coast. 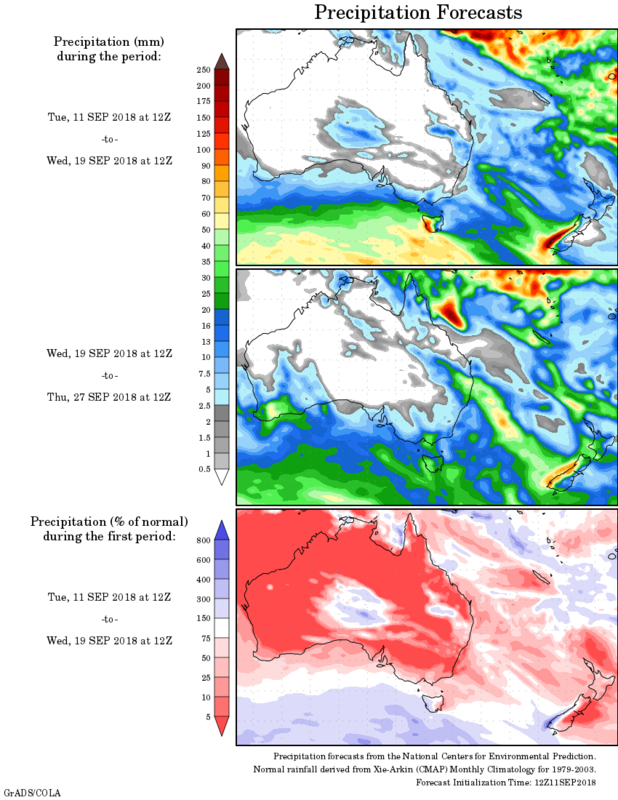 By the middle of the week, a trough moved from central Australia into the eastern States and a low pressure system developed over northern inland New South Wales. As the cold front tracked across the southeast moderate totals fell in parts of eastern New South Wales, central and northeastern Victoria, and northern and western Tasmania. The system stalled over northeastern New South Wales before moving slowly offshore, with showers and thunderstorms continuing over the southern interior of Queensland, and northern and central New South Wales, with widespread light falls lingering over southeastern Queensland. In the last part of the week, a cold front and trough embedded in a strong westerly flow generated moderate falls in northwestern Tasmania. Another cold front approached and tracked across southwest Western Australia, with light falls recorded about the southwest of the State. Rainfall totals exceeding 50 mm were recorded in parts of western and northern Tasmania, and an area of northeastern New South Wales. The highest weekly total was 133 mm at Ballina in northeastern New South Wales. Rainfall totals between 10 mm and 50 mm were recorded along the southwest and southern coasts of Western Australia, far southeastern South Australia, central and northeastern Victoria and South and West Gippsland, most of Tasmania, large parts of eastern New South Wales, and in southeastern and central Queensland. Little or no rainfall was observed in remaining parts of Western Australia, the Northern Territory, most of South Australia, northwest Victoria, western New South Wales, and most of Queensland away from the southeast quarter.